Jack pine-dominated ecosystems in northern Lower Michigan consist of open, low-fuel barrens within dense, high-fuel jack pine forests. Modern forest management has prioritized jack pine plantations for Kirtland’s warbler habitat, but has reduced naturally-created landscape heterogeneity. We investigated heterogeneity in fuels and stand structure in fire-created stands using field data from 41 permanent plots sampled 6, 16, and 39-years after the Mack Lake wildfire. Vegetation structure and fuel abundance have changed over time and vary across different landforms, elevations, and soil textures. To investigate effects of climate change on the broader landscape we used a forest disturbance and succession model ( LANDIS-II) with historical, current, and future climates predicted from general circulation models to quantify changes in fire severity and barrens distribution attributable to climate change. Combined, these projects investigate processes that can influence long-term management decisions in the region, particularly in the context of Kirtland’s warbler and wildfire management. Julia Sosin has a B.S. in Environmental Science from Wayne State University and is currently working on an M.S. in Biological Sciences with a focus in forest ecology. She enjoys planting wildflowers, measuring trees, and writing. Maggie Tucker is a postdoc in the Department of Biological Sciences at Wayne State University. 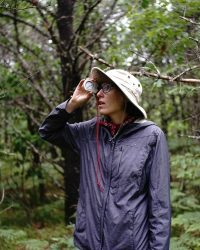 Her research focuses on forest and landscape ecology, specifically investigating the disturbances that shape landscapes within northern Lower Michigan. Maggie received a Ph.D. in Biological Sciences from Wayne State University in 2018.